If you want to search this page. Down the centuries the British love of an open fire has never waned. To fan the flames of this passion the designers of the nations buildings have made the fireplace a functional and decorative feature; a place of warmth and contentment. There is a lovely feeling to entering a British inn when the distinctive smell of a real fire hits the nostrils and of course on a cold day, there is nothing better than settling in front of a roaring fire with a pint of traditional ale. A real fire should ideally mean open to the room and burning half a tree ! although coal is also acceptable. Where inns have a real fire, we show a fire symbol. In the Great Halls of the Anglo-Saxons both lords and lackeys lived a communal life eating and sleeping around the open fire set in the middle of the Hall. The smoke drifted up through a hole in the roof as best it could. A smokey life - but a comparatively warm one. Later the hearth was moved back to the safety of the wall. The earliest surviving wall fires are those at Colchester Castle of about 1090. The chimney arrived in the 12th Century, and in the 14th Century it was decreed that they be made of stone, tiles or plaster. The Elizabethans held that in the days before chimneys, people had been immunised against diseases through exposure to smoke. A view that would be ridiculed today. A real fire involves the daily business of cleaning and re-setting, but to many people, there will never be a substitute for the real thing ! In Victorian and Edwardian times, the use of cast iron meant that decorative fire sourrounds could be made, these were often bordered with ceramic tiles where they were fitted in to cast iron inserts or registers and laid on the hearth thus enhancing the look of the fireplace. Tiles were also frequently used in furniture, especially washstands, and were used on walls. Tiles used in fireplaces and washstands are usually the most decorative as their primary function was to add decoration. Tiles were also used on walls and in floors but here decoration was secondary, the primary purpose was to provide easily cleaned durable surfaces. This hard wearing aspect, and the high cost of tiles, means that wall and floor tiles were usually restricted to high traffic areas. Victorian public buildings often had tiles to dado rail height in the lobby or entrance hall, in domestic properties wall tiles were usually restricted to the vestibule, and then only frequently found when the vestibule did not have an outer door. 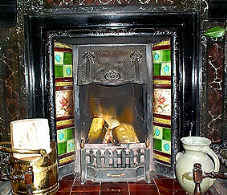 The Victorians used many arrangements of tiles in fireplaces. Ten tiles all the same were popular whereas continuous five tile panels were quite scarce. Most tiles in fireplaces were a combination of different types and sizes of tiles. There is a wide variety of combinations even for the standard format of 6" wide by 30" high, equal to five 6" x 6" tiles. Some fireplaces were designed for more than the standard ten tiles. Fireplaces requiring twelve tiles, the extra two in the canopy, are quite common. Foundries had iron plates which could be inserted where the canopy tiles fitted, and on occassion brass and copper plates are found.